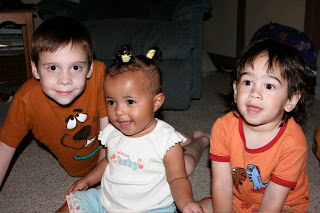 To round out the end of National Adoption Month, I'm re-publishing the following post, which was originally dated 9/06. 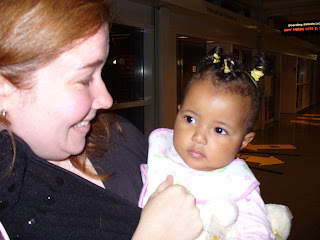 This is the story of our Ethiopian trip to bring Marlie home. 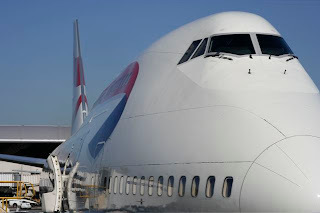 Friday, August 18th we began our journey to Ethiopia via British Airways. We flew from Los Angeles to London, and London to Addis with a stop in Alexandria, Egypt for fuel. It was a grueling day and a half of travel. We arrived in Addis at 1am Sunday morning, only to find that none of our 4 bags had arrived with us. Gotta love the new security restrictions that no longer allow you to take your cosmetics, toiletries, contact solution, etc. with you on the plane. So that means if your bags don’t arrive, you basically have NOTHING. Not necessarily a big deal if you have a Target on every corner but when you are in Ethiopia, it’s not so easy to replace those items. So... no bags means no clothes, including underwear, no make-up, no toiletries, no over-the-counter medications, no baby clothes, no diapers, no formula, etc. Every BA employee we talked to said the same thing. “We don’t know where your bags are... maybe they will come on the next flight”. Oh, if only that were the truth. We arrived at the guest house around 2am. The baby house is attached to the guest house. Despite the time, they let us go in and meet our babies. Marlie was fast asleep, of course, but that didn’t stop me from scooping her up and showering her chubby cheeks with kisses. Marshall videotaped the moment. Marlie was incredibly happy and easy going for having been woken in the middle of the night. I was a little surprised to see that the sides and back of her head were shaved. All those beautiful curls were gone and now all that remained was a ridiculous-looking mop of hair on the top of her head like a mohawk of curls. Mulu (the attending nanny) just looked at me and smiled when I tried to ask her why Marlie’s head was shaved. I’d have to wait until I was in the presence of a nanny who spoke English before I could find out the reason for the shaved head. 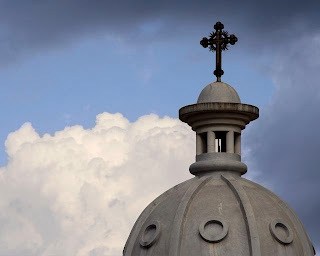 We finally drifted off to sleep about 4am Sunday only to be awoken at 6am by chanting/singing via loud speakers at the local Orthodox Christian church. We were later informed that an Orthodox Christian holiday was just a couple of days away, so they were preparing themselves (and us) with the early morning chanting. We soon learned that as the holiday grew closer, the chanting started earlier and lasted longer until eventually there was round the clock chanting all day/all night. The one day after the holiday it was complete silence. We slept so well that night! But alas, the chanting resumed the following day, though at a very reasonable 4am. I am told that this happens at all Orthodox Christian churches, so that wherever you are, you will be blessed to awake to such sounds. Remind me to not return to Ethiopia during a Orthodox Christian holiday. Our first morning in Ethiopia, Mulat (our driver) took us to a local store to buy some supplies. “Store” is a bit of a euphemism. We got bottled water (useful for brushing your teeth), shampoo, soap, deodorant and chapstick. Only one brand available for each thing, but I wasn’t picky. They didn’t sell contact solution but one of the adoptive fathers in our group shared his supply with me. The other adoptive families in our group were so generous in sharing their things with us. We borrowed at least one item from each family in our group. We tried hard to have a good attitude about our missing bags, keeping in mind that we had arrived safely and we had the most important thing... our daughter. Bags or no bags, we would bring her home with us. 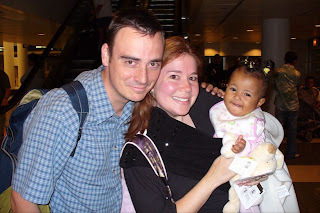 We decided not to take custody of our baby girl while we were without our bags. The lack of baby clothes, diapers, formula, etc. would make it difficult for us to care for her. For the time being, we decided to leave her in the care of the nannies and visit her often. Getting to know Marlie during the week was so wonderful. Toward the end of the week her face would noticeably light up when she would see us. Frequently a nanny or other staff member would take her from us and shower her with kisses. Staying at the guest house and being around the nannies and staff so much, we were able to see first hand how much they loved the kids and how well they treated them. Even the guards and the driver held the kids and showered them with affection. 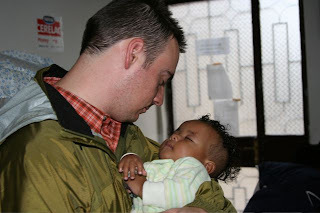 Ethiopians have such a loving and warm culture and have a real love for the kids. We enjoyed getting to know the nannies/staff, especially Sinadu, Eskadar and Sister Tirhas. Sister Tirhas was the nurse on staff at the orphanage. When someone becomes a nurse, the title “sister” is added to their name. Sister Tirhas is the one who stayed with Marlie when she was hospitalized for 7 days with pneumonia. She was able to clear up the mystery of why Marlie’s head had been shaved. Apparently when a baby is admitted to the hospital, they shave the side of the head because that is where they put the IV. Before she was discharged, the nurses shaved the other side and back of her head to make it symmetrical. One interesting tidbit of Ethiopia trivia: They have their own calendar. It’s actually the year 1999 in Ethiopia. That means I’m actually only 25 years old! Next time someone asks how old I am, I will give them my age based on the Ethiopian calendar. We had our meals provided for us at the guest house. Sinadu is an awesome cook. I am the first to admit that I am NOT adventurous when it comes to trying new things and I ate everything Sinadu prepared for us. Some was traditional Ethiopian, some Italian and some a mixture of the two. The Italians occupied Ethiopia for 5 years and as a result, you can usually find Italian dishes on the menu at most Ethiopian restaurants. I did learn the name of my favorite Ethiopian dish which is “Shiro Wat”. It’s a vegetarian stew made with chick peas. 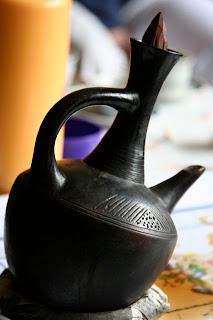 The Ethiopians have a spongy bread called “injera” that they use instead of utensils to eat the food. They tear off a piece of the injera and grab the food with it. One of the most interesting things I was served to drink was “avocado juice”. I didn’t know that avocados made juice. Basically it’s avocado, water and sugar blended together into the consistency of a shake. It was interesting... tasted like sweet avocados. Not my favorite but it did grow on me. 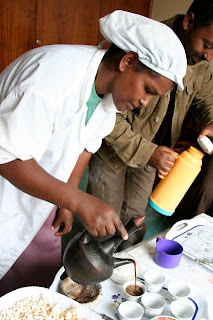 The Ethiopians serve coffee several times a day. One interesting thing is that they always served popcorn with the coffee. What’s the deal with the popcorn? Everywhere we went, they served fresh popped popcorn with the coffee. I’m usually a decaf kind of person, but I was drinking coffee left and right to help me stay awake and function. I needed it with all the sleep I lost due to the Orthodox chanting. 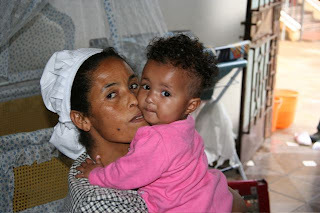 In the middle of the week we took our overnight trip to Awassa to meet Marlie’s surviving birth relatives. 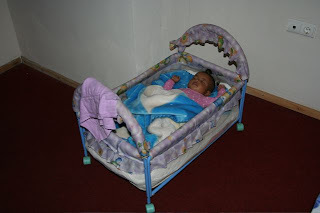 We left her at the orphanage in the care of the nannies and left with our hired driver. Two social workers who were escorting a brother/sister sibling set back to America accompanied us on our trip. It was roughly a four hour drive each way. I was tired but I didn’t want to sleep. I didn’t want to miss any part of the beautiful countryside. The Addis to Awassa road will actually take you all the way to South Africa. Our driver said he did that once, and it apparently took a couple of months to make the drive. 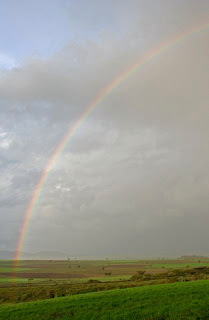 Shortly after we began our trip we saw the most beautiful rainbow I had ever seen in my life. We asked our driver to stop so we could take a picture. It was cloudy and rainy and the picture does not do it justice, but it will remind us of that beautiful sight we saw that day. I had never before seen a rainbow where I could see both ends. 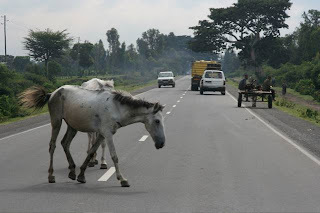 Driving down here can only be described in one way... cars, people and animals all share the road. Frequently we would need to stop because some sort of animal was crossing the road. 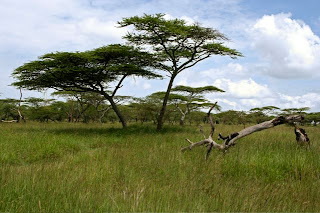 Sometimes it was a herd of donkeys or some other animal being led by a person. Sometimes it was just animals on their own deciding to cross the road at will. The first day we were in Awassa, we met Marlie’s uncle and aunt and her four older sisters, who they have been raising since their parents died. Her aunt, uncle and sisters were such beautiful and loving people. I will hold the rest of the details for Marlie, as it is her story. I will say that I am glad to have met them and plan to stay in contact with them. Our meeting with them and the pictures we took will be such a gift for Marlie to have as a piece of her history. Our four bags finally arrived in Addis the day before we left to go back home. The entire contents of all four bags were soaking wet. We took everything out to let it air dry. I wanted to put on a new pair of underwear so badly but they were all soaking wet. UUGGHH. I had put so much thought and planning into what I packed for Ethiopia, only to find out (out of necessity) that I did not need all that stuff. It would have been nice to have an extra pair of underwear though! My nighttime routine was to wash my one pair of underwear in the sink with handsoap and let it dry overnight. Then in the morning I would put on that slightly damp pair of underwear. I was glad to get the bags back before we left so that we could pack all the souvenirs we had bought for the return trip. 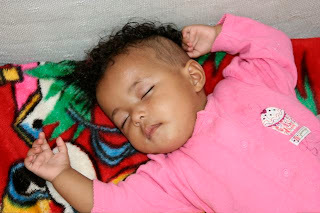 Our last night in Ethiopia we finally took custody of Marlie and had her sleep in our room with us. It was a short night since we had to wake up at 3am to get ready for the airport. It was all a bit surreal. 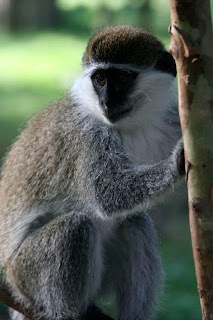 It seemed too good to be true and I was just positive that they would not allow us to leave the country with her. Fortunately my worst fears did not come true and we were able to bring her home with us, without a problem. 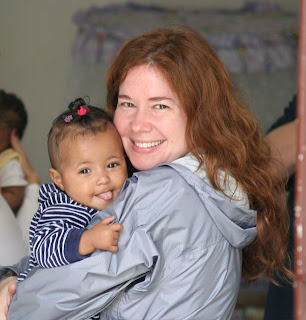 Sunday, August 27th, we boarded the plane in Addis and began our 30 hour journey back home with a lap child. Marlie was a real trooper, but I don’t want to do that again! In fact, I don’t want to fly again for a long time. We flew Addis to Egypt, to London, to Chicago, to Los Angeles. My sister and her husband (who live in Chicago) surprised us at the airport, just outside customs. With the stress of the trip, finally arriving back in the US and seeing my sister, I burst into tears. It meant so much to us that they came to the airport to see us, even knowing that they could probably only have 15 minutes to spend with us before we needed to catch our flight to LA. My sister did manage to have time to snap a few pictures of us. 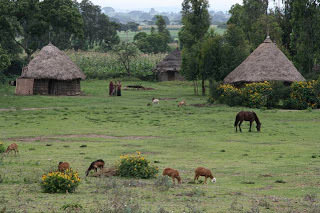 Ethiopia is an amazing country. It’s a country full of the most beautiful people with the biggest hearts and the most extreme poverty. It’s impossible to not be affected by it. This was the trip of a lifetime. We have adopted into the culture. 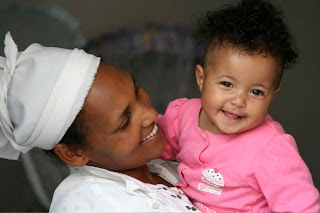 We are now an American-Ethiopian family and Ethiopia will be in our hearts forever. i LOVED reading your blog! I happened to come across it because I recently visited Addis Ababa for the first time last month and fell in love with it. I was trying to recall why they serve popcorn with coffee (I enjoyed the combination), and your blog popped up. I was humored by the pic of the toilet (looked like the one in my hotel...wish I'd thought to photograph it since trying to describe the ornateness of their thrones to friends in the U.S. is challenging). Anyway, I was scanning for the answer to my popcorn and coffee question when I kept seeing photos of the most adorable little girl...Marlie. I took a moment from researching to read what your blog was about. 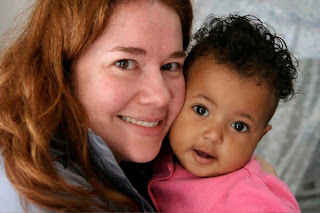 I was so touched by your adoption story and practically moved to tears while watching the video of Marlie's first year. Kudos to you for chronicalling all of these experiences...she truly will have beautiful memorabilia to cherish one day. It's obvious how much fun your family has together, and you're a beautiful looking family, too. All the best to you all for many more years of joy! Thank you so much for your heartfelt comment! We are truly blessed to have Marlie as our daughter and to have had all of our experiences through adoption, including the popcorn and coffee! ;) Though I don't know why they serve them together either.